Lionel Messi is arguably the best player in the world right now. And you can shop now on a huge selection of Messi products. That include official jerseys, shorts, socks, and more from the AFA of Argentina and La Liga's mega team Barcelona! We have everything for you Messi fanatics. CR7 is arguably one of the best player in the world right along side Messi. And we have all the CR7 shoes and jerseys for Juventus and Portugal! Luis Suarez "El Pistolero" is Uruguay's top scorer and is still going strong. He is ready to retain the La Liga title. Shop now in our selection Luis Suarez Official Jerseys, hats, socks and other products for Uruguay and Barca! Neymar is becoming the one of best player in the world and he won't stop till he's the best. And in our collection we have all the Neymar gear for all his fans. That includes official jerseys, shorts, and more for PSG and Brasil! Gareth Bale is becoming the new face for wales as they try to win the Euro's for the first time. He and his fellow team members will be showing the world that wales are the new big team in Europe. We have a variety of Bales products for fans to buy for Real Madrid and Wales. James Rodriguez the little boy that could, he has made a name for himself at the last world cup and best believe he will be out to win any major tournament or trophy he can. Shop now for all the latest James products for Bayern Munich and Colombia. Don Andres Iniesta the Brains for Barcelona has an amazing career but that's not stopping him to achieve more. In our selection of products we have all the Iniesta gear for fans. From official jerseys to shorts to jackets and more for the FEF in Spain and for Barcelona! Kun Aguero is one of the best strikers right now and will continue dominating in Europe's big league as he and Man City try to win the champions league for the first time. Shop now in our collection of official Aguero jerseys for Argentina and Manchester City! Alexis Sanchez is the Chilean warrior. With him on Manchester United side they will try to win the Premier League for the first time in a decade. You can shop now in the latest gear for Sanchez from both his club, Manchester United and country, Chile. Eden Hazard the Belgian star is bound for glory as he tries to take Chelsea and Belgium back to glory again. You can shop now for all of Hazard products. Such as authentic jerseys, jackets, phone cases and more. Wayne Rooney the goal scoring machine. He is England's all time scorer and he bound to extend that even further. In our selection we have official jerseys for Wayne Rooney for Manchester United and England. Zlatan does what Zlatan wants and he only plays by Zlatan rules. So in order to impress Zlatan we offer various products from official jerseys to shorts and more. Shop now on all the great Zlatan products. Paul Pogba is a promising young athlete that will be the next best player of the football world. You can shop Pogba's product from Manchester United and France. Edinson Cavani "El Matador" is a professional footballer for Uruguay and can be seen around the world scoring goals for club and country. We have all things Cavani related to Uruguay and Paris St. German. Find authentic soccer jerseys for the world's top players! 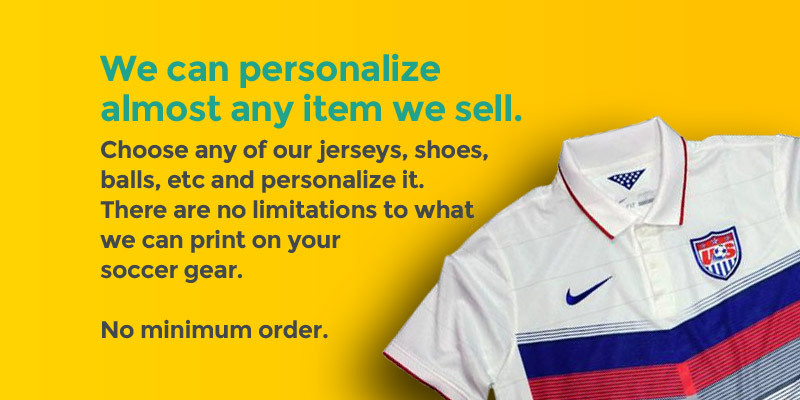 From clubs to national teams, we carry jerseys, shorts, soccer cleats, and other kit for your favorites.